You’ve finally bought the new mattress set you really wanted. Now that it’s all set up, you probably can’t wait to put new sheets on it and make the bed. Not so fast. Before you do, you should protect your investment with a mattress protector. You spend one third of your life in bed, and experts say you should get 7 to 9 hours of sleep a night, so a quality mattress is important. Even a “discounted” bed can be expensive. 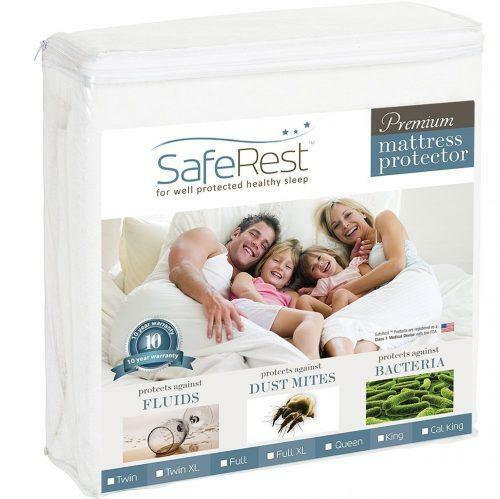 Mattress protectors offer a barrier shield between you and your mattress, as well as an additional layer of comfort. Sweat and other fluids can seep into your mattress during the night, causing yellowing, deterioration and odor. A good mattress protector will you keep your mattress clean, dry and comfortable to sleep on, and you’ll extend the useful life of your mattress. Cleanliness—a protected mattress is cleaner and healthier. A mattress cover is much easier to wash than a mattress. Warranty—most mattresses come with a warranty against defects. But moisture, spills or staining could invalidate your warranty. Allergens—regularly washing a mattress protector removes any allergens (including dust mites) that can affect your sleep. 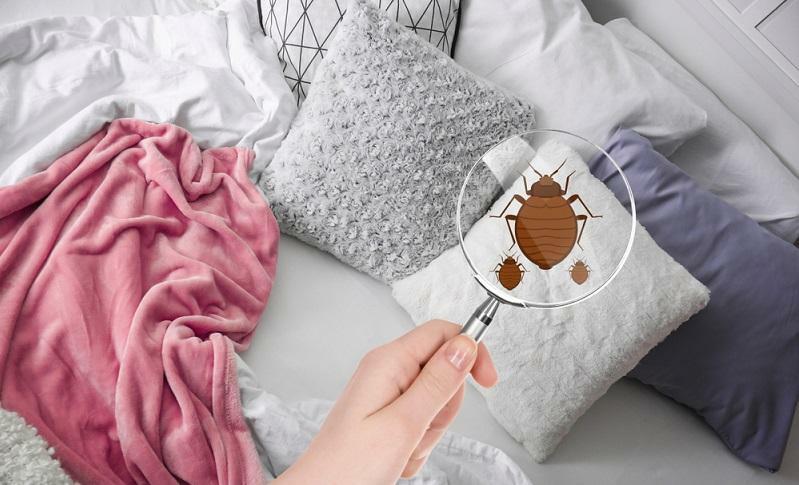 Bedbugs and other pests—use an encasing mattress protector that completely covers the mattress, you’ll be able to keep free from the possibility of pests. Keeps the mattress new longer—since you’ll make contact with the protector and not the mattress itself, there is less wear and tear from regular use. Walk into any store that sells home goods, and you’ll be greeted with a myriad of choices. 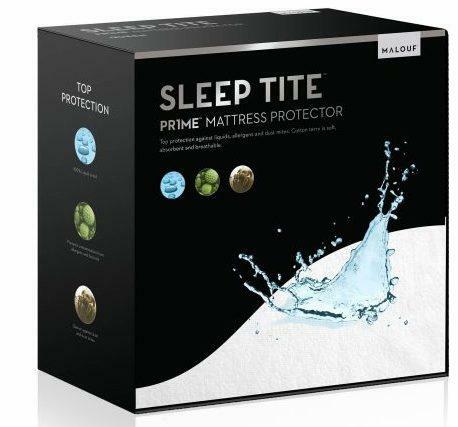 With so many mattress protectors to choose from, you may not even want to bother! It can be a challenge to find the right one for you and your sleeping needs, but it’s just a matter of figuring out the right one. Some are more expensive than others, and that may be a consideration. Buying them at the mattress store may leave you with sticker shock, and you may decide to just buy the cheapest one you can find. But if you’re interested in keeping your mattress fresh, clean and stain-free, nearly any mattress protector is better than none. Decide on what you need, and how much you can spend for one. A little research goes a long way in making an informed decision. Most have warranties and refund policies, so if you don’t like one, you can try another. Need some help finding the best one for your bed? 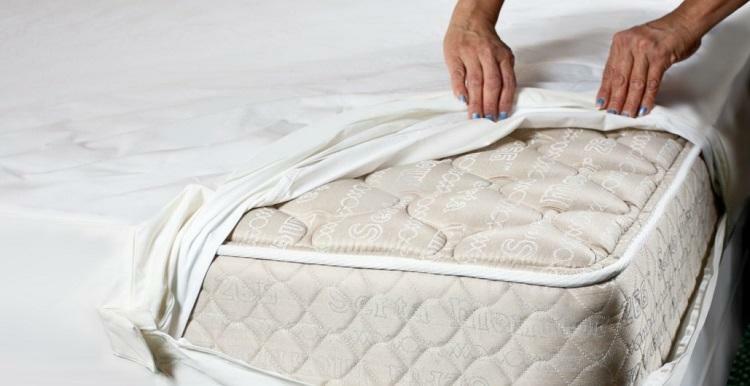 We’ve gathered a list of different mattress protectors to keep your mattress clean, comfortable, and help it last longer while you sleep better. Keep reading to find the one that’s right for you and your sleeping situation. 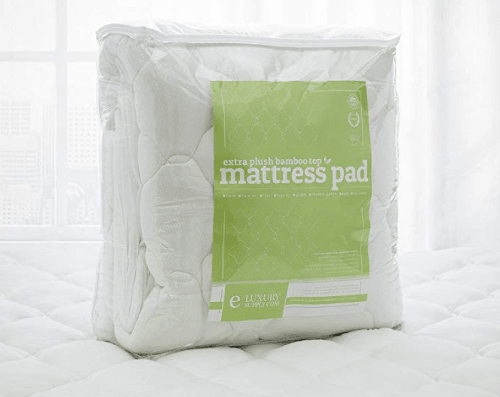 A full organic cotton mattress pad with a waterproof liner that sleeps cool and is certified organic and GOTS non-toxic. There’s no chemical smell and no off-gassing to worry about. Vinyl-free means the ultra-thin liner is waterproof without noise, and they’re machine washable. Priced at $119 for a queen-sized version, they’re manufactured in the US. The pad is a quarter-inch thick, and similar to canvas but softer. Priced at $89.99 for a queen-sized version, this cover is made for memory foam mattresses to keep that “plush” feeling. The organic cotton surface is soft, sleeps cooler and it’s fully washable. 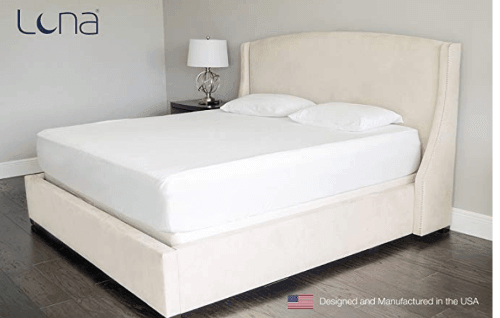 Made in the USA, it breathes well and also has a quiet moisture barrier to keep your mattress clear of any accidental spills. Keeping your mattress clean is one thing. Keeping allergens and pests completely out of it is quite another thing. A mattress cover that doesn’t cover the entire bed isn’t going to protect it. Bedbugs are very difficult to get rid of, if not impossible, so prevention is the key to protect your investment from an invasion. 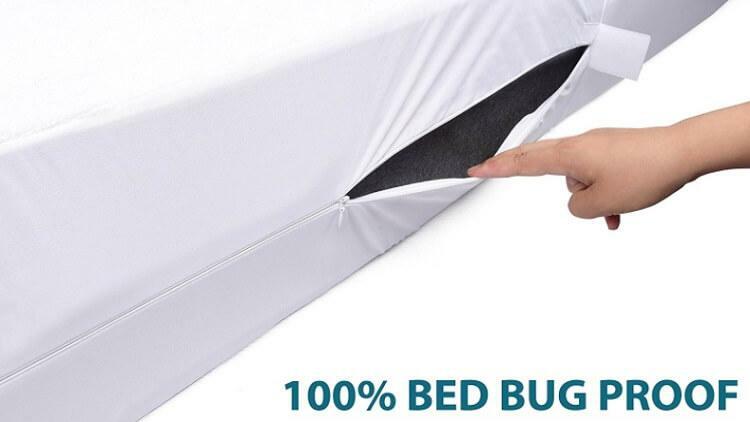 If you’re looking to protect your entire mattress, or you live in an area where bedbugs are a concern, a full zippered mattress protector (also called an encasement) is the best way to prevent bugs from getting into and camping out in your bedding. These two are made to do just that, protect it from the usual dangers as well as block the entry of pests. 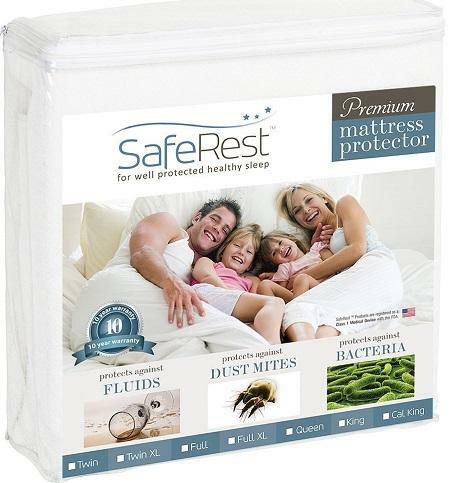 Keeping your mattress clean and pest-free is easy with Sleep Tite’s encasement protector. Two halves zip together around the middle to form an impenetrable barrier to protect your mattress. The vinyl-free H2Pro membrane is quiet, and gives it the waterproof properties you need while keeping out dust mites, bed bugs and allergens. The top half zips off for easy machine washing, and has a zipper that prevents bugs from getting in. It fits mattresses up to 22” high. Lab-certified to protect against bed bugs and liquids, Sleep Tite offers a 100% waterproof guarantee and a 15-year warranty. At $135 for a king size, it’s a more expensive option. 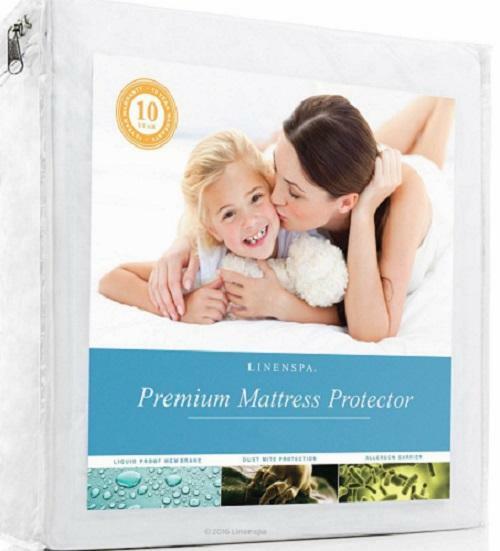 Another six-sided zippered cover that’s less than half the price, it fits mattresses 13” to 16.” SureGuard’s protector is also hypoallergenic, fully zippered and comes with a 10 year warranty. A quiet, comfortable protector, it’s also Independently lab tested and GREENGUARD Gold certified, as well as free from vinyl, PVC, phthalates, fire retardants and other toxic chemicals. It’s machine washable and get softer with every wash. 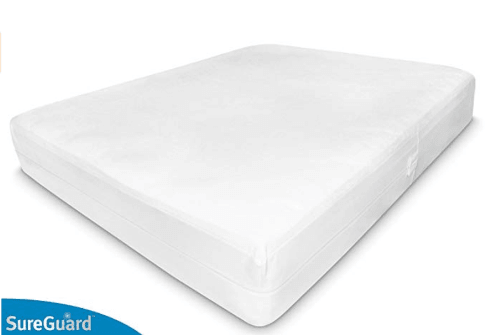 Some users report that it is not waterproof and does not completely stop bedbugs from getting into the mattress. It’s no secret that sleeping on memory foam can be like a giant heating pad for some sleepers, especially during the summer months in the South. 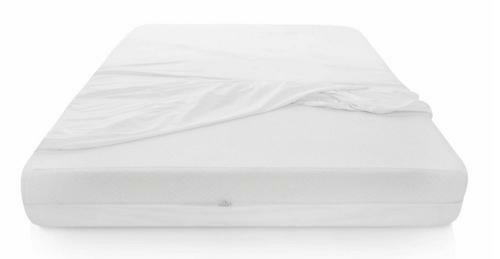 If you tend to sleep hot, or wake up sweating, consider a cooling mattress protector. 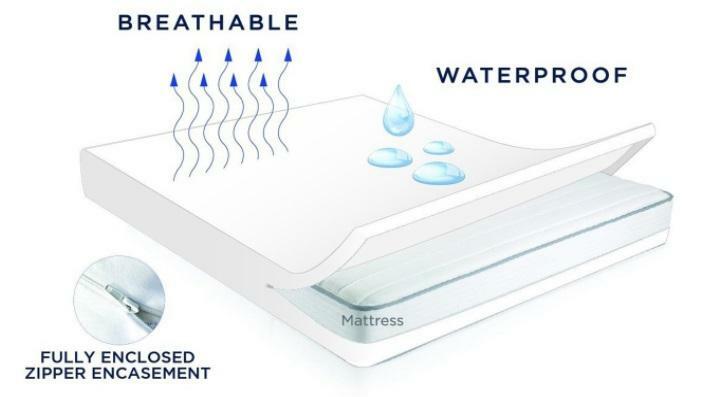 It prevents trapped heat from the mattress from sweating you out with trapped heat. While it doesn’t prevent hot flashes and night sweats, it can help keep collected heat from the mattress from waking you up at night, and making a hot flash even hotter. 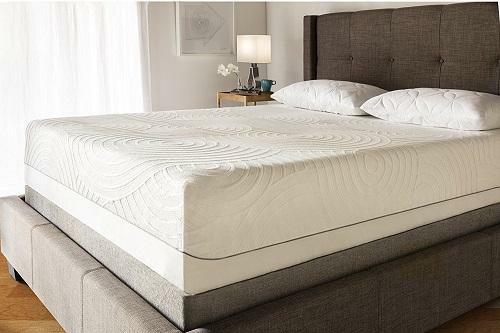 This top rated Amazon’s Choice for “bamboo mattress topper” is made by a veteran owned company in the US with excellent customer service. The hypoallergenic down-alternative filling is stitched with a double-needle baffle box stitch to keep it from shifting if you move around. It works with any type of mattress, whether memory foam, innerspring or latex, and fits snugly. It’s plush–but because it’s not memory foam, it won’t “sink” or lose its shape. At about $100, it’s a little more expensive than most, and tends to be too big for a standard home washing machine. While it doesn’t change the feel of your mattress, it does offer additional cushioning, which will come in handy during pregnancy, or if you have arthritis or other chronic pain. Some users report that the original pads didn’t make it through the washer; however, the company has replaced those free of charge with newer ones that are manufactured differently. 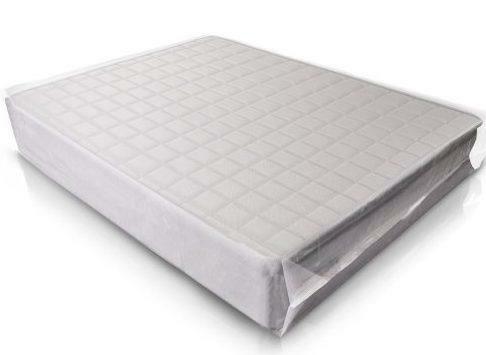 This vinyl-free mattress protector is an Amazon’s Choice for cooling mattress pads. 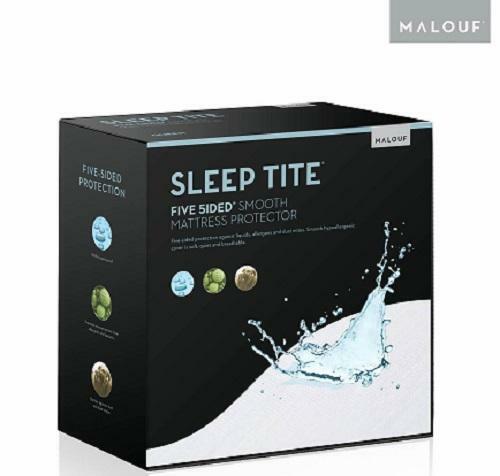 It’s hypoallergenic, waterproof and resistant to dust mites, as well as breathable for a better night’s sleep. Bamboo also adds moisture wicking to keep you dry and comfortable all night. The waterproof TPU backing keeps moisture and liquids away from your mattress, but you won’t hear any “crinkling” noises when you move around. The cover is also free from Vinyl, PVC, Phthalates, fire retardants and other offgassing chemicals. Utopia Bedding’s “Smooth Grip System” ensures that the protector stays in place no matter how much you move around in your sleep or how many times you turn over. Tends to slide around at night, pulling sheets with it. Nobody likes talking about this, but it’s a problem that can happen to anyone (or anyone with children.) Any kind of liquid can damage a mattress and invalidate a warranty. But bedwetting is a bigger problem, because you just can’t clean a mattress like you can a mattress cover. 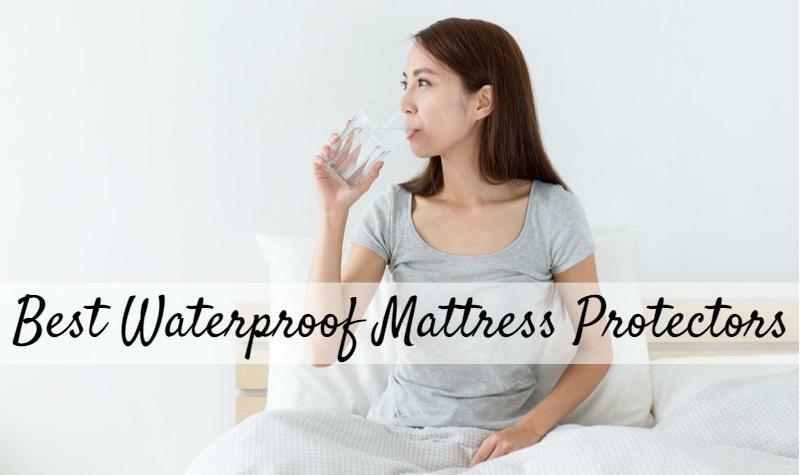 So if you’re dealing with this delicate issue, for whatever reason, you’ll need a more waterproof mattress protector to keep your mattress from getting damaged. Like the others, there is no end to the type you can buy, some better than others. 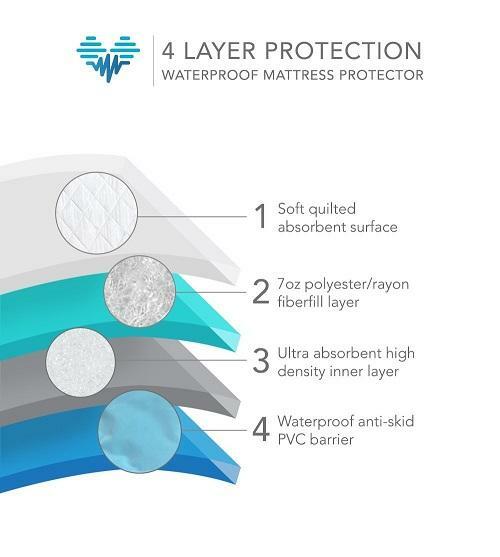 Most mattress covers made now incorporate some kind of waterproofing element into their products. We’ve located a few for your consideration that we hope will make this uncomfortable problem a little easier to deal with. This #1 Amazon Choice best-seller has nearly 30,000 customer reviews, with more than 85% of them 4-star and 5-star ratings. Made to fit beds up to 18” deep, it will not change the feel of your bed, and is registered with the FDA as a Class 1 Medical Device. 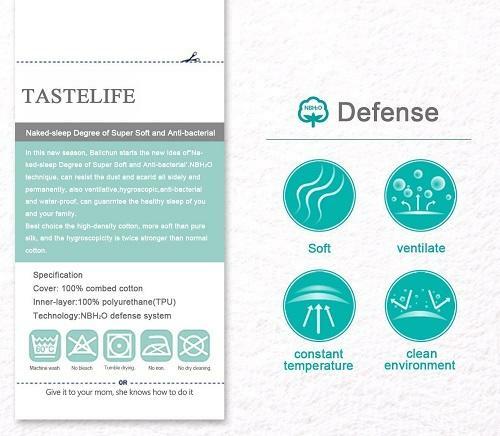 The hypoallergenic cotton is soft and breathable, yet waterproof and quiet to sleep on. It’s also Free from vinyl, PVC, phthalates, and fire-retardant chemicals, as well as machine washable. Resistant to bedbugs, dust mites and other pests, it’s also great for families with children and pets. The fitted sheet design ensures that it stretches to fit your particular bed easily, and it comes with a 10-year warranty. 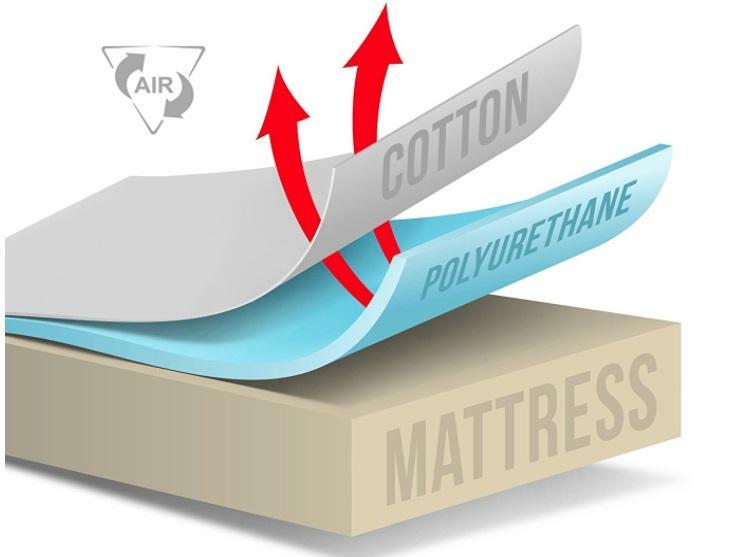 The cotton terry surface of this mattress protector is also cool, breathable and comfortable using Luna’s Airflow Tec It’s made and sourced in the US, free from phthalates, vinyl, and PVCs and machine washable (although dry on a lower heat setting or air dry.) 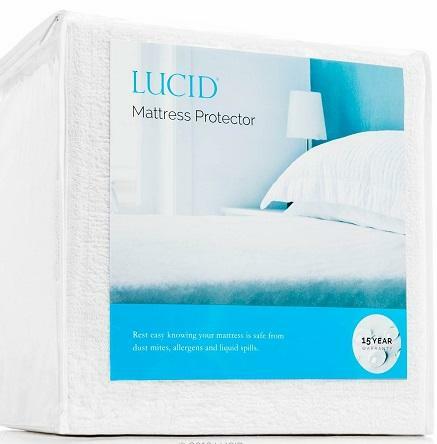 An Amazon’s Choice mattress protector that’s also hypoallergenic—so allergy, asthma and eczema suffers can sleep better. 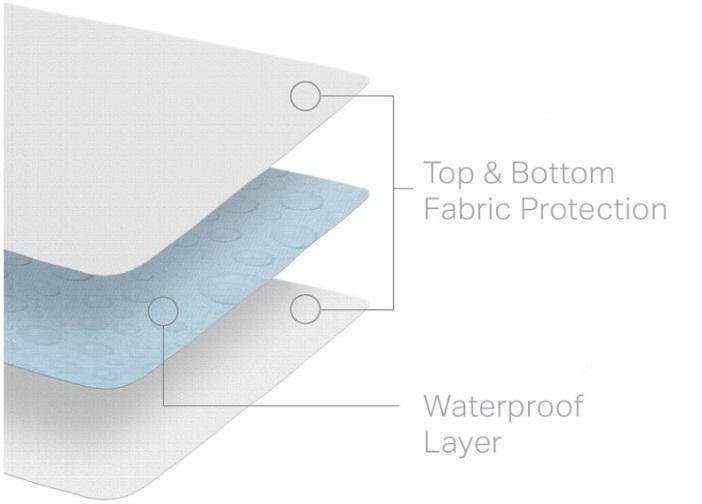 While the top layer absorbs moisture, the inner layer prevents it from seeping through to your mattress, keeping it dry and clean. Some users find it not as waterproof as advertised, especially with children. An Amazon Choice product, it’s vinyl free and has a 15-year warranty, and is moderately priced at $50 for a queen sized model. The fitted-sheet style fits beds up to 22”. The 100% cotton terry cover makes for a breathable, quiet and comfortable night’s sleep while keeping your mattress clean and free of stains and moisture. They’re especially good for memory foam, but will work with any type. The absence of vinyl keeps it quiet and eliminates chemical smells that may come with it. When you’re in the middle of a move, you may not think about protecting your mattress. But that’s when they can suffer real damage, and you may end up buying a new one anyway. Think about how you (or a crew) handled your mattress when you bought it, and was probably wrapped in plastic. Without all that protective shipping plastic, what will happen to your mattress between your old bedroom and the new one? Military families who move frequently know this all too well. From sliding them around to dropping them into moving trucks (or on the ground in the dirt), your wonderfully comfortable mattress may not make it to your new home intact. Water, dirt, bugs and any other manner of damage can happen to a mattress and quickly ruin it. If the mattress and box spring are intended for long-term storage, mattress moving protectors are essential to keep them from accumulating dirt and attracting pests. Protecting your mattress during the moving process will keep your mattress clean and safe so you don’t have to buy another one before it’s time. It’s a product most people don’t realize they need until they need it, or after a move. If you or someone you know is planning to move soon, get some now, while you’re thinking about it. These mattress moving protectors are just the thing to make sure nothing happens to your sleeping investment during a move or in storage. 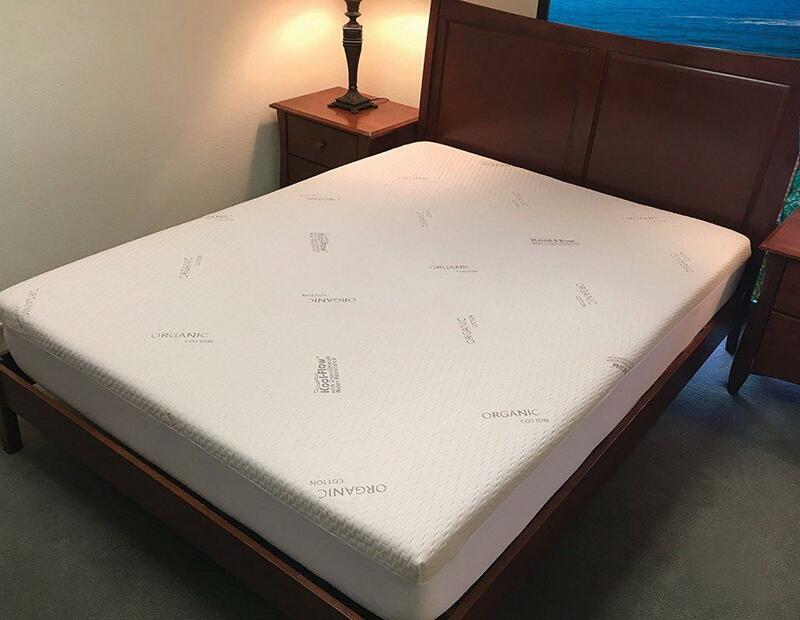 An Amazon’s Choice for mattress moving protectors, this reusable plastic protector is a commercial-grade 5 mils thick and much more durable than standard mattress moving bags. 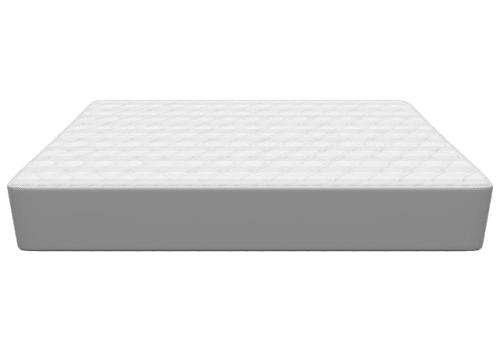 Made to fit any size and type of queen-sized mattress, including pillowtops and extra-thick. No handles on your mattress? Slide the mattress into one of these bags and handle it with ease. It’s also good for returning a mattress if you’ve discovered you’ve bought the wrong one. 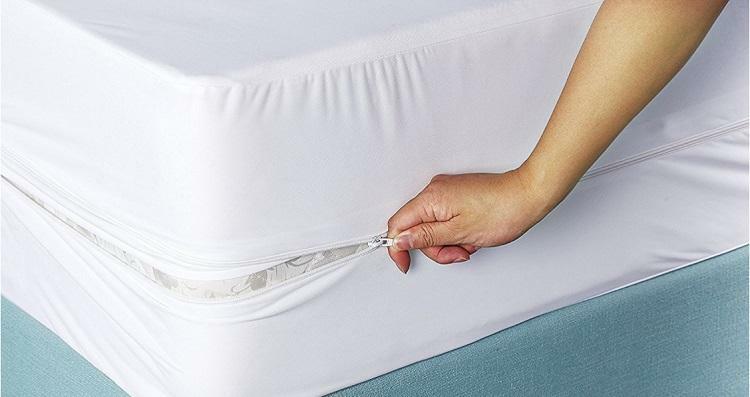 Sealing is easy—just close up the ends and seal them with packing tape to keep bugs, dirt and moisture out and away from your mattress. At just $15.99, these heavyweight pillowcase-style bags are an easy and economical way to protect your investment from the elements and other damage that can happen during a move. 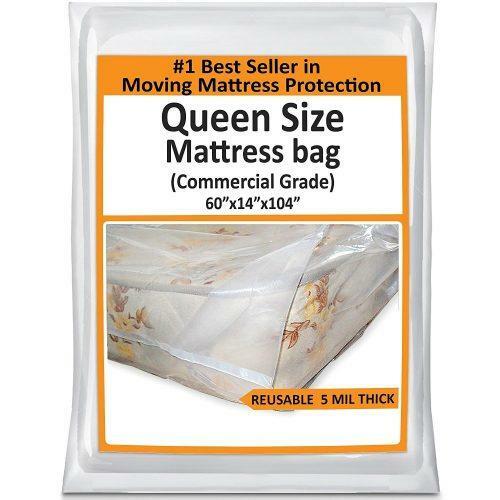 MovingHost also makes these moving mattress protectors for king, twin and full sizes, so you can protect any and all of your mattresses during a move and/or in a storage facility. When you’ve finished with them, they fold up and store for another day. No closures, must use packing or duct tape to seal. These clear vinyl bags are 4 mil thick, reusable and puncture resistant. 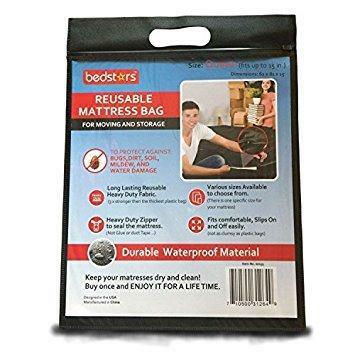 These bags open up into 3D shapes to ensure complete coverage for your mattress, and uses packing straps to keep them closed without adhesive. 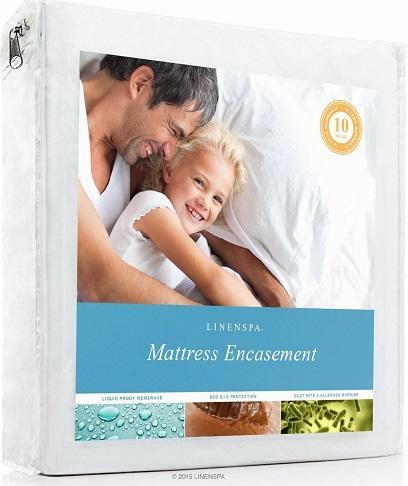 They’re made to protect your mattresses through moving and storage, and keep them clean and dry while they’re there. The plastic is breathable, so moisture buildup won’t be a problem while it’s moving or in storage. When you’re done with them, just roll them up and secure them with the packing straps for the next time you need them. A two-pack is just $18.99, and will last through many uses. This easy-to-use protector is much thicker than standard plastic, and is 1,000% stronger than the standard plastic bags. They’re made to fit standard sized mattresses, with a heavy-duty zipper to keep them closed and protected. These nylon cases are sturdy and will fit even the thickest mattresses, giving you peace of mind that your bed will be ready to sleep on when you take it out. A queen set is priced at $45. Mattress protectors are a great and inexpensive way to protect your investment as well as improve it. 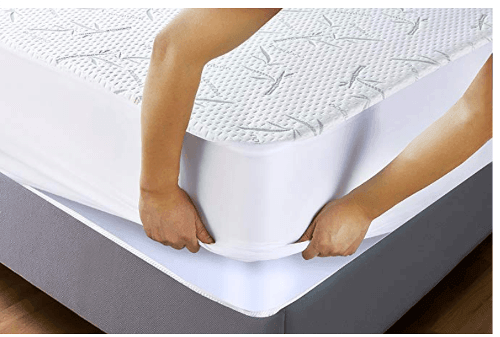 Whatever your needs, you’ll find a great variety of products to keep your mattress in new condition for a lot longer.